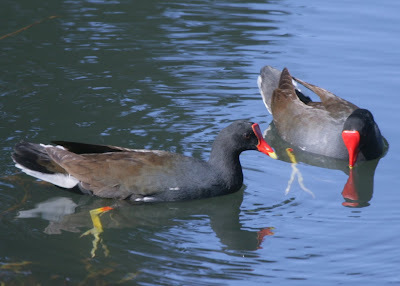 Four years ago, experts estimated there were less than 300 Hawaiian gallinules – ‘alae’ula - left in the world. They were nearly all in two locations on Kauai. They are normally so shy and hard to count that that 2005 estimate was an optimistic guess. The real number could have been 200. No-one has counted since. In the last two weeks, after local flooding, between 2 and 4 have been killed every day as they tried to cross a small section of road beside the Hanalei River. Up to 50 lost in two weeks - and no response at all from the state department paid to protect them. The casualties occur just after the bridge crossing of the Hanalei River. A constant stream of tourist and local traffic cuts through the wetland at 30- 40 miles an hour. Tourists are gazing into the distance at the awe-inspiring scenery; but locals frustrated by the unpredictable speeds are just as guilty. No-one is thinking of the tiny little dark bird trying to cross the road between their wheels. Elegant in the water - look at the long toes for gripping and climbing submerged rushes .. 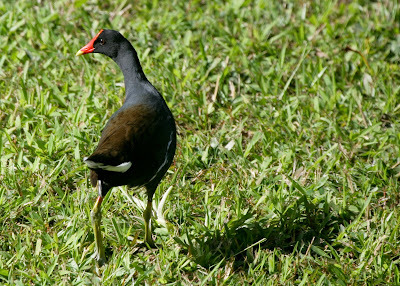 The ‘alae‘ula don’t normally cross the road like this, and are not usually victims of road kill. Something happened during the recent flood to drive them from their secret territories. 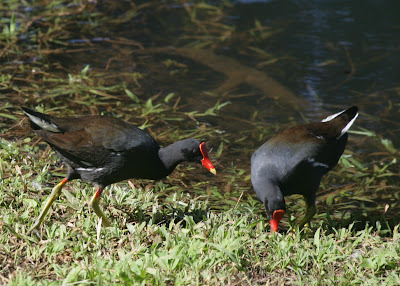 It was thousands of years ago that a few small-winged gallinules somehow managed to cross two-and-a-half to three thousand miles of ocean and reach the Hawaiian islands. Once here, they adapted, evolving differences that distinguish them from their mainland ancestors. They have become much darker, the tarsi and toes show changes, as well as their voice, and they have been on the endangered species list for several years after most of their wetlands were drained and multiple predators were brought to the islands. ‘Alae ‘ula have a wealth of history and mythology linking them with the native people. They gifted fire, and all of them belong to the beautiful goddess of the moon Hina. There is another, more positive, ‘alae’ula activity happening right now. On Kauai, they have formed a bond with a certain species of tree that for several months in winter scatters generous numbers of juicy plums across the ground. In recent history, every native plant the birds once depended on was grazed by cattle or ploughed up, and is no longer available. 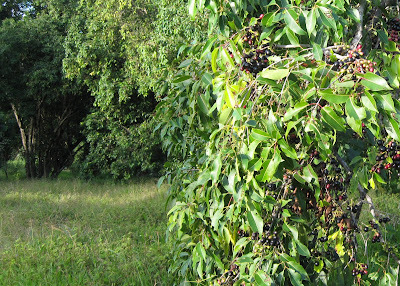 But among the thousands of trees that were introduced to prevent erosion there is one called the Java or “China” Plum. For several months throughout the summer it produces panicles of blossom that attract all kinds of nectar-eating birds and insectivores. During the winter, for several months, the same tree scatters its fruit on the ground, fulfilling the need for fruit in the diet of wild birds. At least three endangered species are enjoying its fruit just now. As well as the ‘alae ‘ula, koloa (Hawaiian Duck) and nene (Hawaiian Goose) gather hungrily beneath the trees. There is some competition. 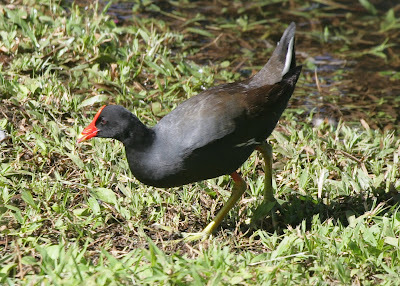 In the last two days an ‘alae’ula has been searching beneath one very prolific tree close to the river every hour. The koloa are there at dawn and dusk. But a fruiting java plum tree will bring them into the open even in the brightest hours of the day. Nene always check the ground beneath these trees as they pass, and it is not unusual to see the three endangered species feeding together under a single java plum tree. Unfortunately, all that fruit is an inconvenience to people. 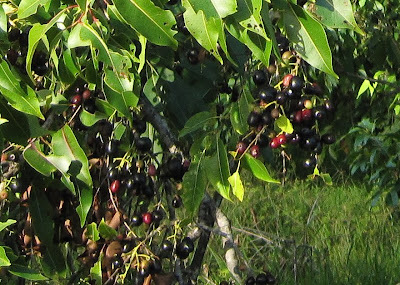 The Java plum is regarded as a “weed tree” – especially by anyone who unwittingly parks their white car underneath it and returns to find it covered with hard-to-remove bright purple stains. It is among the first tree to be removed when people move into an area. 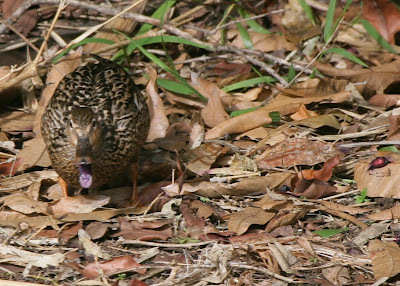 However, it is clearly playing an important nutritional role for these endangered species at a time when two of them are on the very brink of extinction, Koloa hybrids now outnumber pure koloa because of introduced mallards. The ‘alae’ula’ has a shrinking habitat, extreme vulnerability to predators, and competition for food resources. It would be sad if the next generation of children could not marvel at the fire-giving bird, or gazing in wonder at the moon and imagining Hina could no longer see her cherished bird. Searching for more plums. The tip of the bill is already stained purple. For now it is heartwarming to watch these endangered birds feasting together – sometimes with comical results. The koloa especially take the whole fruit in their bills, but are unable to close them. They lean their heads back and roll the fruit around as violet purple juice drips from their mouths, staining their tongues purple. 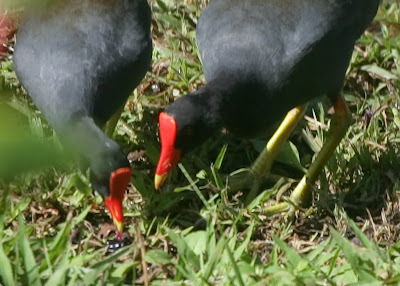 The ‘alae ‘ula, with their sharp-pointed bills, have a more precise peck that removes the pulp from the seed on the ground but leaves the yellow tips of their bills in various stages of purple. Female Koloa rolling a plum in her bill. Note purple staining of tongue and bill discarded plum on the right after the fruit has been removed.